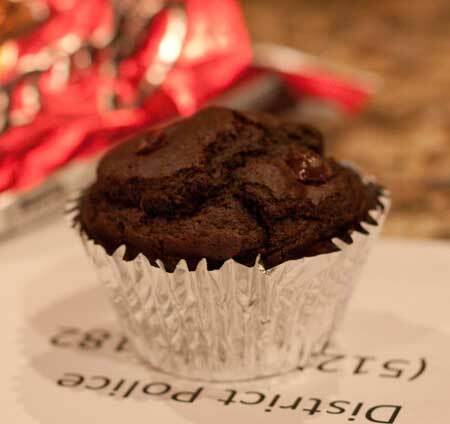 I was in the mood for brownies, but Fuzz wanted chocolate muffins. Coconut Oil Chocolate Muffins were our compromise — very chocolaty muffins, sweet enough for dessert, but not so sweet they’d be confused with cupcakes and rich enough not to need icing. In other words, they’re true muffins and not cupcakes. The coconut oil added a hint of coconut flavor and gave the muffins a nice texture, but if you don’t have any coconut oil you can just use oil. I did a few more experiments where I tried to replace the egg with drained applesauce and used soy yogurt for the buttermilk. That one didn’t go over so well, but I did get good results when I replaced the sugar/cane sugar with Fibrelle sugar substitute. 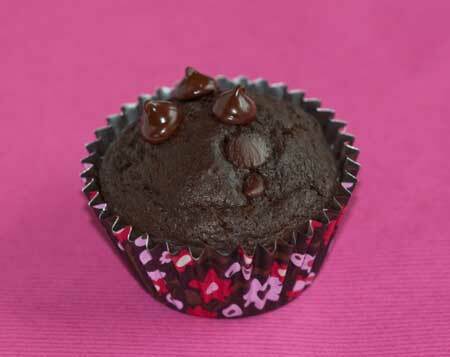 If you like artificial sweeteners, this muffin is a good way to use them. Just be sure you use the equivalent to 3 tablespoons of sugar — some sweeteners are 1 to 1 volume and others vary, as you probably know. Here’s another photo. This one’s actually a jumbo size muffin. By the way, this recipe halves well. Just cut everything in half and for the egg, use 2 tablespoons lightly beaten. Preheat oven to 400 degrees F. Line 9 muffin cups with paper liners. If you're making jumbo size muffins, line 4 or 5 cups. Mix the flour, baking powder, baking soda and salt together in a bowl. When well mixed, stir in the cocoa powder and evaporated cane juice (or sugar or sugar substitute). Stir in the chocolate chips. In a mixing bowl, whisk together coconut oil and egg. When well mixed, gradually whisk in buttermilk and vanilla. Add the dry mixture to the wet mixture and stir just until blended. Divide batter evenly among the muffin cups. It should come up almost to the top of each cup. Bake on center rack for 22 minutes or until the muffins appear set. Let cool in the muffin tin. Making this now just put in oven my first attempt with coconut oil! Today is the day, I am making them!!!!! Pretty exited! I’m making these now- they smell great from the oven! These look amazing! Perfect for a sweet breakfast or an after dinner dessert. Yum! These would get me up in the morning! I LOVE baking with coconut oil. Just started using it literally months ago. great flavor and it’s really good for you too! As always. These sound wonderful! These look absolutely decadent and would be perfect to pack in lunches without worrying about the frosting getting messy. Since I seldom have buttermilk on hand, I was wondering if the taste would differ much if I used buttermilk made with milk plus vinegar or lemon juice.